Arriving on Board - Go Navy Go! 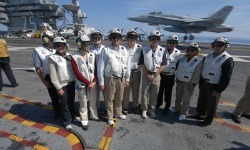 Our adventure began on Saturday, September 12, 2009, when 10 Leaders to Sea participants gathered at Naval Air Station Norfolk, Virginia. We boarded a Navy C-2 Greyhound airplane (also called a COD for “Carrier Onboard Delivery”), which flew us about 120 miles off the Virginia coast, where the USS Harry S. Truman was conducting requalification exercises. Unlike commercial planes, the CODs are all about practicality; no frills. There are no windows for the passengers; most of the sailors slept on the flight anyway. (With minimum 12-hour shifts, they take every chance they can to sleep!) And we sat facing the rear instead of the front of the airplane — safer in case of impact, and less shock during the arrested landing.